Dr. Joel Kahn is a plant based cardiologist whose personal mission is to prevent 1 million heart attacks over the next two years. 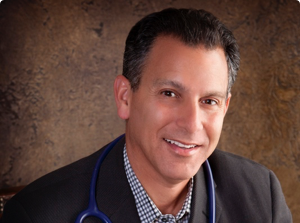 He is a Clinical Professor of Medicine (cardiology) at Wayne State University School of Medicine and has a Amazon #1 Top Selling book, Dead Execs Don’t Get Bonuses, published by Reader’s Digest. Dr Joel Kahn’s personal mission is to prevent 1 million heart attacks. 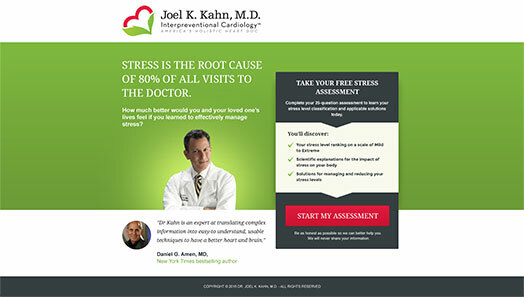 Dr. Kahn has been a practicing cardiologist for over 20 years but knew that to increase his impact, he would have to help people online and the best way to do that was to grow his email list. Dr. Joel Kahn started by creating a quiz to help people learn how stressed they were. Once someone answered the quiz questions, the would opt in with their name and email to find out how stressed they were and how that stress was affecting their bodies. To prevent 1 million heart attacks, Dr Kahn needed a way to consistently get in front of new people interested in their heart health. The combination of using Facebook ads and LeadQuizzes was the perfect solution, generating 34,189 leads in only 6 months.